The Saint was also zealous in building and repairing churches. He built a new stone church in the center of Novgorod, dedicating it to the Most Holy Theotokos. He repaired the roof of the Church of Holy Wisdom (Christ, the Wisdom of God), and adorned the interior with icons. When war broke out between Novgorod and Kiev, Saint Niphon showed himself to be a peacemaker. Meeting with the leaders of both sides, he was able to pacify them and avert the war. In the same way, he always tried to settle arguments and to reconcile those who were at enmity. He instructed his flock in the law of God, preaching to them, reproving, rebuking, and exhorting them patiently and with sound doctrine (2 Tim. 4:2) so that they might obtain the salvation which is in Christ Jesus with eternal glory (2 Tim. 2:10). When the people of Novgorod drove away their prince, Vsevolod, they invited Prince Svyatslav to govern them. The new prince wanted to enter into a marriage which was against the Church canons. Not only did Saint Niphon refuse to perform the ceremony, he also told his clergy to regard this betrothal as unlawful. Prince Svyatoslav brought priests in from elsewhere to perform the wedding, and the holy hierarch was not afraid to denounce his behavior. After the death of Metropolitan Michael of Kiev, the Great Prince Isaiaslav wished to have the schemamonk Clement succeed him. However, he wanted to have Clement consecrated without the blessing of the Patriarch of Constantinople. At a council of bishops, Saint Niphon declared that he would not approve the consecration without the permission of the Patriarch of Constantinople. He reminded the other bishops that this was contrary to the tradition of the Russian Church, for Russia had received the Orthodox faith from Constantinople. The uncanonical consecration took place despite the objections of Saint Niphon. Metropolitan Clement tried to force the Saint to serve the Divine Liturgy with him, but he refused. He called Clement a wolf rather than a shepherd, for he had unjustly assumed an office which he did not deserve. Saint Niphon refused to serve with Clement, or to commemorate him during the services. 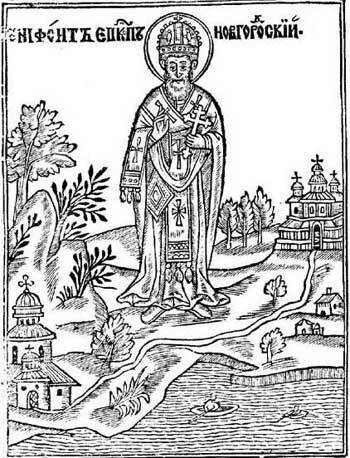 In his fury, Clement would not permit Saint Niphon to return to Novgorod. Instead, he had the Saint held under house arrest at the Kiev Caves Monastery. When Isaiaslav was defeated by Prince George, Saint Niphon returned to Novgorod, where the people welcomed him with great joy. The Patriarch of Constantinople sent a letter praising Saint Niphon for his steadfast defense of Church teachings. He also sent Metropolitan Constantine to Rus in order to depose Metropolitan Clement, and to assume the see of Kiev himself. 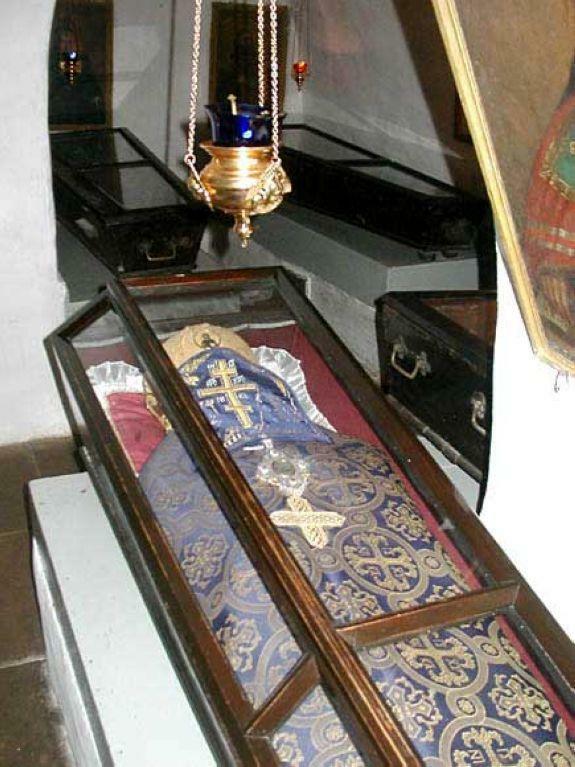 Saint Niphon prepared to journey to Kiev to meet Metropolitan Clement. 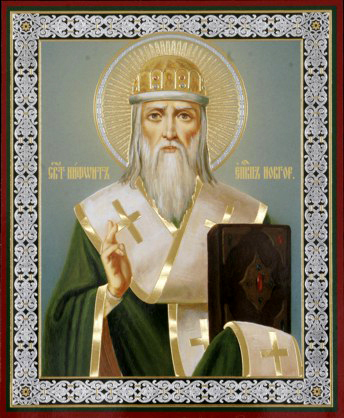 Saint Niphon again took up residence in the Kiev Caves Monastery, where he became ill. Three days before his death, he revealed to the brethren that he had had a wondrous dream. Saint Theodosius (May 3) appeared to him and announced his imminent departure from this world. Saint Niphon reposed in peace thirteen days after his illness appeared on April 8, 1156. Now he stands before the throne of God, interceding for us before the All-Holy Trinity, to Whom be all glory, honor, and worship forever.